C. aenea of Michigan Flora. Dry open sandy ground, cut- and burned-over forests, roadsides, less often in moist ground or forested areas. 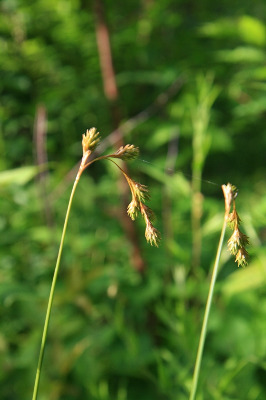 This is a successional species generally appearing after soil disturbance or fire; the nodding coppery or reddish brown inflorescences are a characteristic feature of disturbed sandy soils in northern Michigan. MICHIGAN FLORA ONLINE. A. A. Reznicek, E. G. Voss, & B. S. Walters. February 2011. University of Michigan. Web. April 19, 2019. https://michiganflora.net/species.aspx?id=962.